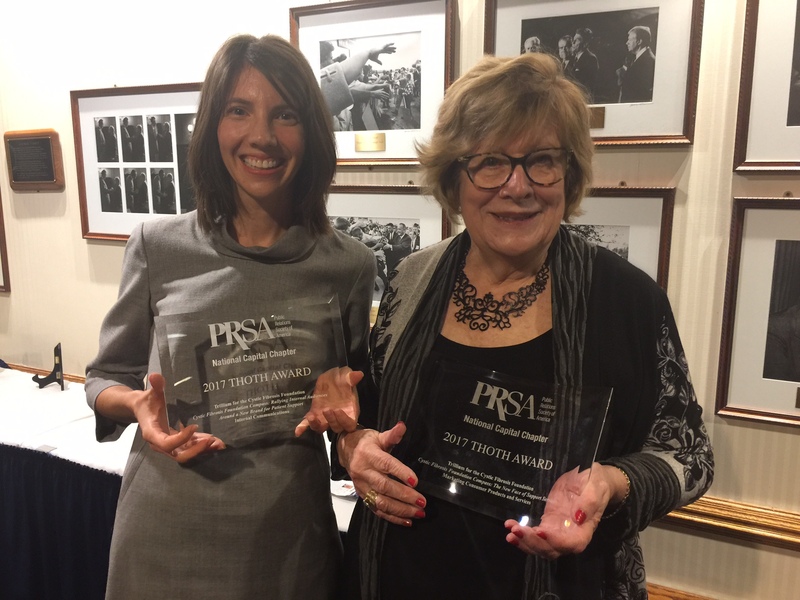 October 12, 2017 – Trillium garnered top honors in two categories at the Public Relations Society of America National Capital Chapter’s (PRSA-NCC) Thoth Awards for Cystic Fibrosis Foundation Compass, bringing to five the number of major marketing and communications prizes in 2017 for the campaign. Trillium rebranded and relaunched the CF Foundation’s services that help with insurance, financial, legal, and other concerns as one comprehensive offering—Compass—resulting in a 258% increase in assistance cases handled in the first year. The efforts were honored with the top Thoth Award in two categories: Marketing Consumer Products and Services and Integrated Communications for Organizations with fewer than 10,000 Employees or Members. See the Compass case study. Each year, PRSA-NCC’s prestigious Thoth Awards recognize outstanding work in the Washington metropolitan area. Named for Thoth (pronounced “tot”), an Egyptian god of wisdom who was a mediator and scribe and credited as the inventor of communications and writing, the awards are given in 34 categories for the best PR campaigns and tactics. The Compass campaign was also recognized in 2017 with awards from the Public Relations Society of America and the National Public Health Information Coalition. August 14, 2017 – Trillium has once again been recognized for the Cystic Fibrosis Foundation Compass campaign, this time earning the National Public Health Information Coalition’s (NPHIC) Silver Berreth Award for a Corporate Health Marketing Campaign. The announcement was made during the Centers for Disease Control and Prevention’s (CDC) National Conference on Health Communication, Marketing, and Media in Atlanta. Trillium’s award recognizes the rebranding and relaunch of the CF Foundation’s patient assistance services as one comprehensive offering—Compass—which increased assistance cases by 258% in its first year. See the Compass case study. NPHIC is the leading national organization for public health communication professionals. The awards are named for the late Donald Berreth, former director of the Office of Public Affairs for CDC and NPHIC’s founder. View the complete list of 2017 Berreth Award entries and winners. June 8, 2017 – Trillium has been recognized with two Silver Anvil Awards from the Public Relations Society of America (PRSA) for the Cystic Fibrosis Foundation Compass campaign. 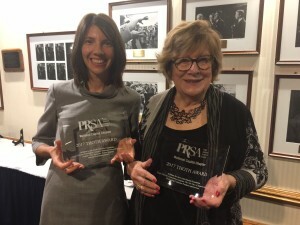 PRSA received nearly 700 entries and awarded 56 Silver Anvils. Other winners included large, international public relations firms with their clients such as JetBlue, Hilton, and NASA. The Cystic Fibrosis Foundation was among only a handful of health nonprofits selected by the judges and announced at a gala ceremony in New York. Since 2015, Trillium has been working with the Foundation to reposition and promote its services that assist people with CF, families, and healthcare providers with insurance, financial, legal, and other concerns related to life with CF. Trillium helped the Foundation brand and launch its formerly underutilized services as one comprehensive offering: CF Foundation Compass. Within the first year, patient assistance cases handled by the Foundation increased by 258%. Key to success was deeply engaging stakeholders throughout the process. See the Compass case study. Since its inception in 1944, the annual Silver Anvil Award has been recognizing excellence in public relations and communication. The iconic award symbolizes the breadth of talent among industry practitioners while recognizing outstanding individual professional achievement. Entries are judged on their research, planning, execution, and evaluation, while also considering factors such as creativity, ethics, and budget. 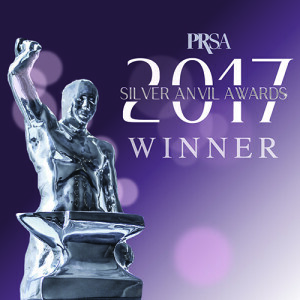 View the complete list of 2017 PRSA Silver Anvil Award Winners.